These Nutella French Toast Roll-Ups are quick and easy to make and a fun, finger-friendly treat for breakfast or brunch. Trim the crusts off the bread. With a rolling pin, roll each slice of bread until flattened. Spread each slice of bread with a layer of Nutella (about 1/2 tablespoon per slice), and tightly roll up the bread slices. In a small shallow bowl, whisk together the milk, egg, sugar and vanilla. Set aside. In a separate small shallow bowl, mix together the sugar and cinnamon and set aside. In a large nonstick saute pan over medium heat, melt the butter. 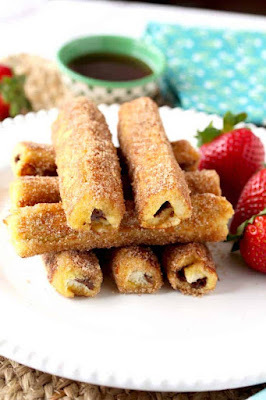 Dip each Nutella French Toast roll-up in the milk and egg mixture. Place the roll-ups in the pan and cook for about 2 minutes, turning them as needed until they are golden brown and slightly crisp on all sides. Repeat until all the roll-ups are sauteed. Immediately after removing the roll-ups from the saute pan, roll them through the cinnamon-sugar mixture until all sides are coated. Serve them warm with some maple syrup on the side. 0 Response to "Nutella French Toast Roll-Ups"